Your diesel or gasoline engine doesn’t sound like a real car? It would be the best to sound like an eight-cylinder engine? No problem. The Sound Booster Pro by KUFATEC makes this happen – for electric vehicle as well. 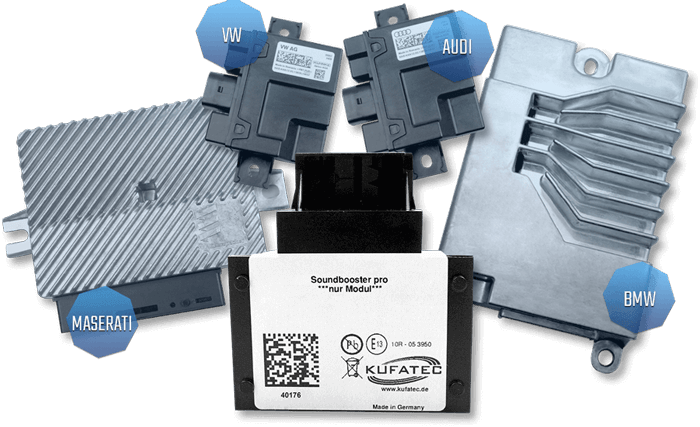 KUFATEC produces the Sound Booster Pro for almost every car make and model. 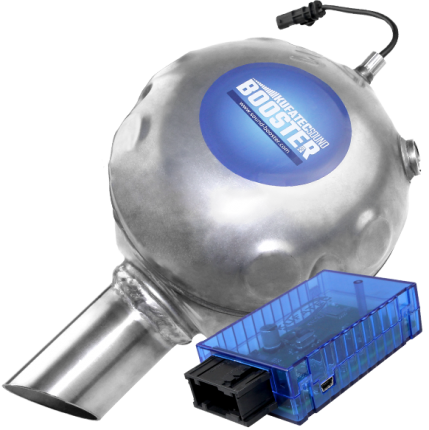 Especially in times of heightened environmental awareness and lower consumption of fuel the Sound Booster Pro is the perfect solution for a tuneful exhaust sound. You neither need a gas-guzzling V8-engine nor an expensive exhaust system for giving your car a sound like it's large engined. The best part about it: the Active Sound System can easily switched on and off at the touch of a button. With our new app "KUFATEC Link" you can now control and adjust your Sound Booster with your smartphone. 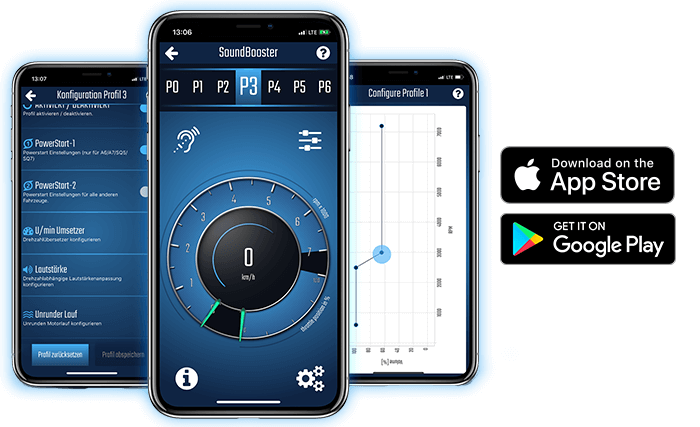 Our new Sound Booster module has a Bluetooth connection and can be linked to your smartphone. With the app you can change profiles and edit them in detail - every possibility you already know from our software. Simply download KUFATEC Link from the Google Play Store or the Apple Store. 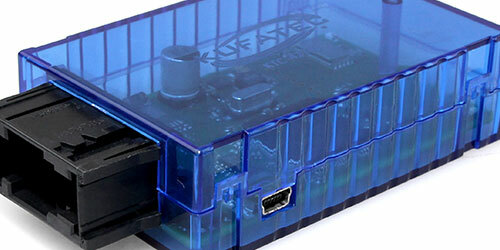 The external connected ESM (external sound module) can be selected in the software since firmware 2.79 and software 1.0.17.0. You get the sounds, which other manufacturers are using for their cars. After replacing the ESM, the module has to be selected in the software. The diagrams need to be adjusted in accordance with that. You can select from 6 tone profiles, which sound almost identical on every car-model because the generation of the noise is using the same system. You can always handle the volume. This is important if you drive through a noise protection zone, where a certain volume mustn’t be exceeded. You can set adjustments for your desired engine tone easily with the KUFATEC Sound Booster Pro software. Create your own sound profile and load it into your Sound Booster. What's special about it? – You decide how loud you want to have the Active Sound System depending on the revolutions per minute. Discover all the possibilities of our software and the variety of the profiles! 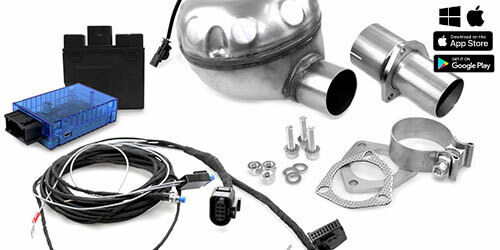 The Intensify Boost Kit is the upgrade for sound generators installed ex works. This kit allows you to intensify the Active Sound System which is already implemented in your car by the vehicle manufacturer. Of course you can use the KUFATEC Software with this kit as well to create your own tone profiles. 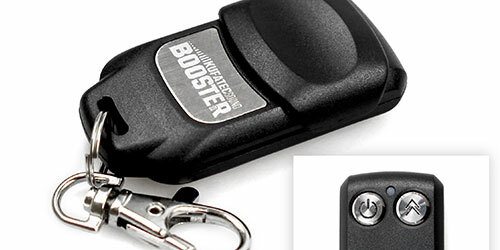 ...read more about Intensify Boost Does this kit match? This kit is exactly customized for a specific car and can be installed at the car without welding or drilling. We did a test installation with this kit and adjusted everything especially for this specific vehicle. The special holder enables an easy installation and especially a firm grip and therefore lots of security. 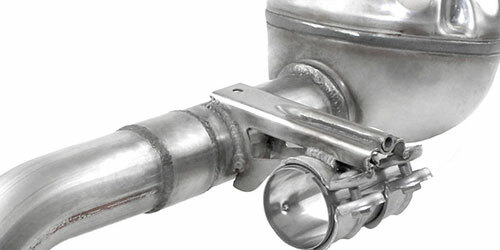 Easily increase your exhaust sound! ...read more Is there a vehicle specific kit for me? With the universal kit you can equip almost every car which has no specific kit. 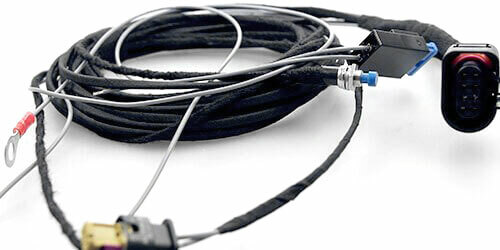 If your car fulfill the requirements for an Active Sound System, however, you need to weld. For adjustments in the software we are gladly at your disposal. 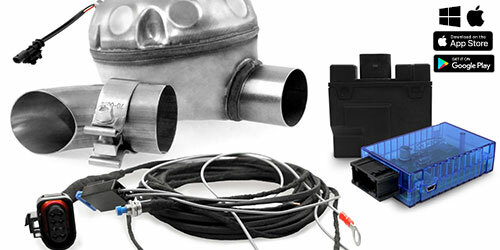 ...learn more about this Can I install this kit in my car? The universal kit for the installation inside differs from the installation outside kit only from the mounting place. Exactly like our "outside" kit this kit is almost suitable for every car, which has no vehicle specific kit. Learn more about the differences here. ...more details Is this the right kit? Electric cars are a very brilliant invention, but have a huge disadvantage in sounding. Driving ecology-minded but not waiving a rich engine tone is possible with the Sound Booster Pro. The consumption of the car doesn’t change, and at the same time the engine sounds like much more power. ...more about this Can my electric car be equipped? With our extension kits you can expand your Active Sound System even more. Enjoy an even more increased tone experience with a second Sound Booster or use the new remote control for your bunch of keys to switch the Active Sound on or off or change the profile comfortably. You can also exchange the external sound module by Audi for the one by Maserati to design the nuances in timbre even more sporty.